I am thankful Family Friendly Gaming purchased a copy of Crash Bandicoot N-Sane Trilogy on the PS4 for this review. I gave up on the PR and Marketing people for this game being professional in any way, shape or manner. They failed us so badly that I am amazed they could be employed this industry anywhere after this fiasco. This contains three retro games remastered. The games are Crash Bandicoot, Crash Bandicoot 2 Cortex Strikes Back, and Crash Bandicoot Warped. These are three original Playstation video games. They have been remastered to look much better. Activision did more than port these three games across. 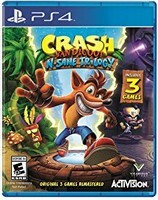 Crash Bandicoot N-Sane Trilogy also costs forty dollars brand new at the most. It may come down in price by the time the review is released. Crash Bandicoot N-Sane Trilogy came out for forty dollars brand new. Which is a good selling price in my opinion for three Playstation games that have been remastered. Plenty of frustrations from the original games can be found in Crash Bandicoot N-Sane Trilogy. Blind jumps, unfair hits, and more can be found in this game. Crash Bandicoot N-Sane Trilogy gives out all kinds of extra lives. They are needed based on all of the cheap deaths in these three games. The 2D levels with a bit of 3D in them make this home console game hearken back to the original Playstation era. I will have a review of Crash Bandicoot N-Sane Trilogy in issue #123 of the exceptional Family Friendly Gaming e-mag, and regular magazine. Crash Bandicoot N-Sane Trilogy irritated and frustrated me. There are some annoying levels in this game like the chase levels. I did however learn perseverance thanks to Crash Bandicoot N-Sane Trilogy.